An objection to having been 'taken out of context' is the first resort of any politician of no matter what persuasion the moment he or she is challenged for being inaccurate, stupid, outrageous, indelicate or some other variation on these adjectives or their synonyms. It's not usual to ask what precisely is the context the speaker in question has been 'taken out of'; it's enough that this desperate, semi-literate plea is its own condemnation. The latest resort to absent contextual sensitivity, however — that of Senator Fraser Anning in order to duck the implications of the phrase 'final solution' in his barbarous maiden speech — perhaps deserves a modicum of contextualising. Reinhard Tristan Eugen Heydrich, also known as Der Henker (The Hangman), the Blond Beast (by his colleagues), the Butcher of Prague (by the Czechs) and 'the man with the iron heart' (admiringly by Hitler) rose rapidly through pre-war Nazi ranks to survive Heinrich Himmler's displeasure and attract Hitler's praise as 'a highly gifted but also very dangerous man, whose gifts the movement had to retain ... for he would eternally be grateful to us that we had kept him and not expelled him and would obey blindly'. Obey blindly he did: slavishly interpreting Hitler's dictum, 'All means ... are legal if they subserve the will of the Führer', and under Himmler's direction, Heydrich formed the Special Action Einsatz groups to assassinate Poland's leading professional, political, religious and aristocratic figures. Turning his attention to Poland's more than two million Jews, he forced those he didn't have executed into Ghettos in Cracow, Warsaw and Lodz where, by half way through 1941, half a million of them had died from starvation, disease or summary execution. And that was only the beginning. In 1939 Heydrich had announced that an ambitious young SS-Obersturmführer named Adolph Eichmann was his 'special expert' in the management of the deportation of Jews into the region known as General Government — the area of Poland not yet part of the Reich. Eichmann supervised this process during which thousands of Jews died in unspeakable conditions on the trains and thousands more in the transit camps. During 1941 the policy of deportation became one of extermination, and Heydrich and Eichmann devoted their energies to achieving the Fuhrer's target of 'the physical extermination of the Jews'. Himmler, who had never experienced combat and indeed never would, was unable to cope with the sight of kneeling Jews being shot by the hundreds and abandoned in an open grave into which they fell as they were cut down. His order that a more efficient procedure be adopted led eventually to the gas chambers and the use of Zyklon B in the concentration camps. Heydrich's efficient, merciless execution of these orders assisted his continued ascent through the Nazi hierarchy and when, on 31 July 1941, Hitler ordered Reich Marshal Hermann Göring to prepare 'a general plan of the ... measures necessary for carrying out the desired final solution (Endlösung) of the Jewish question', it was to Heydrich that Göring turned. Heydrich accordingly convened the Wannsee Conference on 20 January 1942 to coordinate the 'Final Solution', the aim of which was to exterminate the entire Jewish population of Europe and the Soviet Union — about 11 million people in all. Heydrich vowed that 'Europe would be combed of Jews from east to west'. "The Final Solution remained a pre-eminent aim: Himmler instituted Aktion Reinhard — named in Reinhard's honour — and increased the rate and efficiency of exterminations." 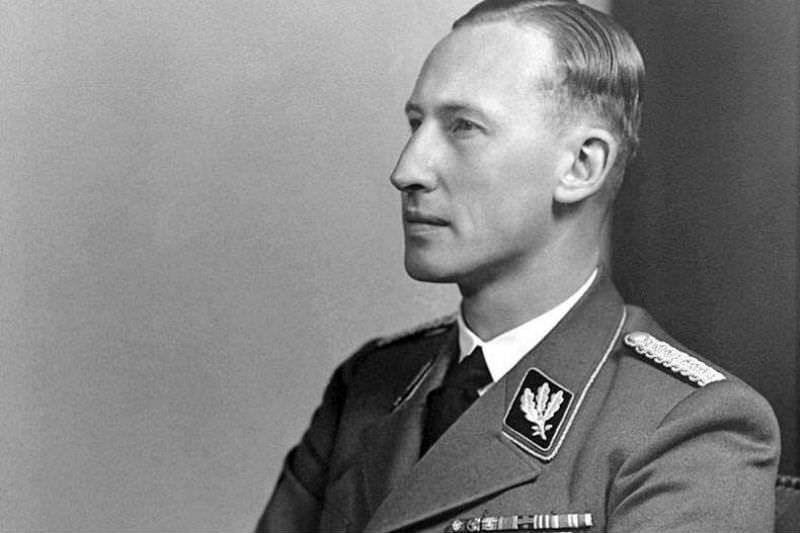 His willingness and efficiency in the business of Jewish extermination earned Heydrich another promotion: he became Deputy Reich Protector of Bohemia and Moravia in former Czechoslovakia and set up headquarters in Prague where he immediately established one of the most notoriously evil of the ghettos, Theresienstadt, and began vigorously earning his reputation as the Butcher of Prague and the most feared instrument of the Final Solution. But Heydrich, always viciously narcissistic, and by now regarded as Hitler's possible successor, had become brazenly arrogant, imperious and murderously ambitious. Spurning protection, he habitually travelled in an open car and was killed by a British trained Czech and Slovak duo, Josef Gabcik and Jan Kubis, in 'Operation Anthropoid'. In Hitler's revenge, all the men of the nearby villages of Lidice and Lezaky, falsely said to be implicated, were murdered, while the women were sent to Ravensbruck concentration camp and 81 of the 95 children taken prisoner in Lidice were gassed in Chelmno camp. Lidice was razed and obliterated. Gabcik and Kubis hid in the crypt of the Church of Saints Cyril and Methodius but were betrayed by colleague Karel Curda for one million Reichsmarks. They were not caught alive. Curda confirmed their identities after their suicide. Two hundred and ninety-four members of the extended families of Jan Kubis and others active in Operation Anthropoid were executed at Mauthausen concentration camp. On 4 September 1942, the bishop, priests, senior lay leaders and some of the flock of the Church were shot by Nazi firing squads at Prague's Kobylisy Shooting Range. The Final Solution, however, remained a pre-eminent aim: Himmler instituted Aktion Reinhard — named in Reinhard's honour — and increased the rate and efficiency of exterminations. There you are Senator (and those parliamentarians who shook your hand in congratulation): will that do for context? Sickened, I can only say "Thank you." We should never forget. thank you Brian, for spelling out the history behind 'The Fatal Solution" - fatal words! Thank you, Brian. I had forgotten. A blessing on you, a keeper of essential memories. I will be forever horrified by the ignorant words of FraserAnning as I am continually by the blinded memories of the Israeli governors in their usurping of impoverished Palestinian lands . I wonder how the calls " Raus Juden Raus" implanted in their genes ring with them when they recall the monstrous deeds of Heydrich and his henchmen. Reinhard Heydrich was a nasty scheming opportunistic man, from his Weimar Republic days as a junior naval officer, to his demise while (Acting) Reichs-Protektor of Bohemia and Moravia. He was regarded as the second-most sinister figure in the Third Reich after Himmler (even more sinister than Hitler, and that's saying something!). He definitely did not "Obey blindly....., slavishly interpreting Hitler's dictum". Between them, Heydrich and Himmler constructed the fine details of the "Final Solution" and the concentration/extermination camp system. Heydrich organised and chaired the "Wannsee Conference" to achieve this (neither Hitler nor Himmler attended this conference). He was a schemer all his life, and that included scheming to get Himmler's job. No wonder Himmler was secretly glad to see Heydrich assassinated. (I am aware the Wikipedia entry on Heydrich suggests otherwise but the evidence is there). A timely and superbly crafted piece! It is also sobering to consider the complicity of several Catholic priest-politicians, especially in Slovakia, in connection with the Final Solution...Tiso, Tuka & Hlinka! Surely this is complete mischievous rubbish to equate Senator Anning's maiden speech with the extermination program of the Nazis preceding WWII. Your article continues the theme in Fatima Measham's previous article. I suggest again, as I did with Ms Measham's article rather than bring in exaggerated academic extensions of Senator Anning’s expressed thoughts, it might be productive to consider why such views find expression in the Australian community in 2018. I recommended previously, as I do here, reading a piece by Peter Baldwin, Minister in the Hawke and Keating Labor Governments in the Weekend Australian of 17-18 September 2016. Thank you Brian for reminding us of the evil context of “final solution”. For what it’s worth, I don’t believe for a moment that Senator Anning was ignorant of this context, or that his use of the term was accidental. I think he knew exactly what he was saying and aimed his words at a particular audience. If he wanted to draw attention to himself he was certainly successful. Thank you Brian for this brilliant but grim reminder of the sickening crimes committed by the Nazis and fascists during WW2. It is a great pity that Fraser Anning did not stop to think about this before he used the term "final solution" in his maiden speech in the Senate. This history is something that should never be forgotten because it shows beyond doubt what happens when people in power lose their humanity. and use their prejudices to commit atrocious crimes against other human beings. And when we contemplate this history, we should never forget that many Nazi war criminals made their way to Australia and infiltrated their way into our political parties. The criminals involved were not just former German Nazis, but also members of the Croatian Ustashe, the Hungarian Arrow Cross, the Slovenian Domobrans, the Serbian Chetniks and the Latvian Arajs Komondo - organisations that assisted in the Nazi agenda against Jews, gypsies, socialists and trade unionists. It is good that so many were outraged by Fraser Anning's appalling speech. Let us hope that this leads them to develop more humane and caring policies when dealing with the poor at home and abroad, asylum seekers, indigenous Australians and those facing prejudice. Brian, thanks for reminding us of the full and unadulterated story of the "final solution". According to his party leader, Bob Katter, Fraser Anning unfortunately missed out on an education, has never read any history books, nor has any interest in ever reading any. Bob supported Anning’s speech “1,000%” as “solid gold”! So there! Quite like Brett, though, I do rather suspect that Senator Anning and his party leader just may in fact have had an inkling of exactly what Senator Anning was saying, its historical meaning and the attention it would get. But in sympathy with Senator Anning’s unfortunate education, I feel inspired to offer a speech he undoubtedly also missed out on way back when: “If I were dispos’d to stir / Your hearts and minds to mutiny and rage, / I should do Brutus wrong, and Cassius wrong, / Who, you all know, are honourable men. / I will not do them wrong; I rather choose / To wrong the dead, to wrong myself, and you, / Than I will wrong such honourable men.” Fraser, here’s hoping that one day you learn something about history. God help the people you represent as a Senator if you don’t. Fraser Anning is described in this article as "semi-literate", and his garbled bigotry seems to support that diagnosis. I see the poor man as being like a rabbit caught in the headlights, having read a speech that he had been assured would lead to fame and re-election. His election, like many of a similar ilk, shows the brokenness of our electoral system, particularly in the Senate. Having "ordinary people" there has a value, but it also exposes us and them to bearing the price of being in a house of deliberation, without ever having deliberated on anything, let alone "the final solution". Anyway, thanks, Brian, I remember you with affection from "Sinny Uni" in the seventies. BTW, for what it is worth to the unfortunate victims, Theresianstadt, probably due to its more westerly location, was very far from as bad as the majority of other concentration camps.